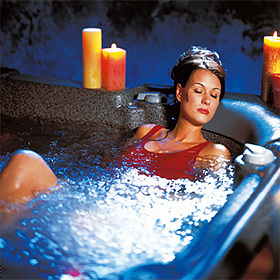 Saratoga Spas - experience hydrotherapy at home. Saratoga Spas has taken the time to engineer their shells to be comfartable first and foremost. Saratoga Spas offers versatility in mold and seating styles, allowing each user to customize their own hydrotherapy experience. Saratoga Spas knows when your comfortable first, it's always easier to relax. Saratoga Spas has designed two therapy systems and appropriate jet styles to customize your therapy needds, something no other spa brand can offer. The Versa-Flo and CFE jetting systems allow the user Direct Impact Therapy and Passive Impact Therapy all in one system.